As soon as the weather starts getting cold, I’m reaching for my eggs, cream, rum, and whiskey. In this video, I take you outside to mix up your own eggnog for one. Many recipes are for a whole batch with a dozen eggs or more – those are great too! But with this recipe, you can make yourself a glass as needed. I prefer mine with cream over milk, so I use it in this recipe. Use whatever whiskey or brandy you prefer. I tend to like a easy drinking bourbon like Elijah Craig, Evan Williams, or Rebel Yell. 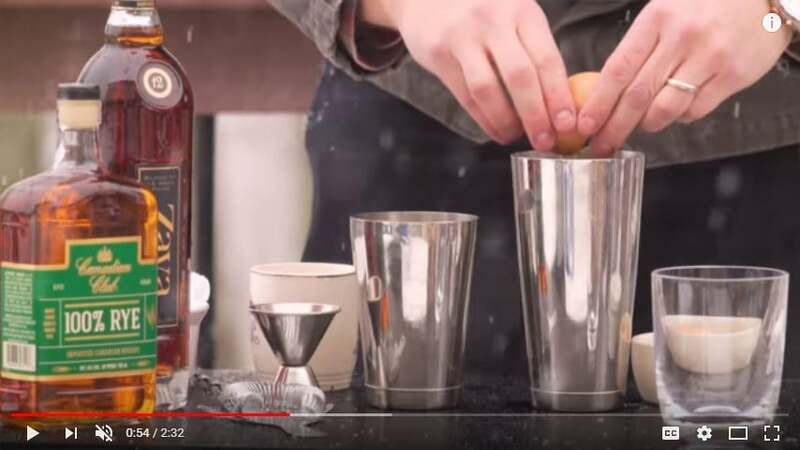 In this video I used a Canadian rye whiskey, which was delicious, but if I’m in the mood, a smoky scotch like Highland Park is great here too. Brandy is always nice. For the rum, I definitely like an aged rum like Zaya better than a silver because of the complexity and vanilla notes that come from the barrel aging process. Sometimes, I will even switch the proportions of rum to whiskey/brandy. There is a lot of room here for customization. And since you don’t have to make a big batch, you can dial in your preferences and make what you like! This is based on Jerry Thomas’s recipe via David Wondrich. David has an excellent video here on YouTube that you should also watch. I’m standing on the shoulders of giants. Culinary Tyrannosaurus, passport stamp collector, home cook, pilot, strength enthusiast, bilingual, coffee roaster, recovering homebrewer. Committed to DIY ethic. Minnesota native transplanted in Pennsylvania. Thunderbird MBA Alumni and Golden Gopher. Undyingly positive and open minded. Drives Jill crazy by questioning everything.